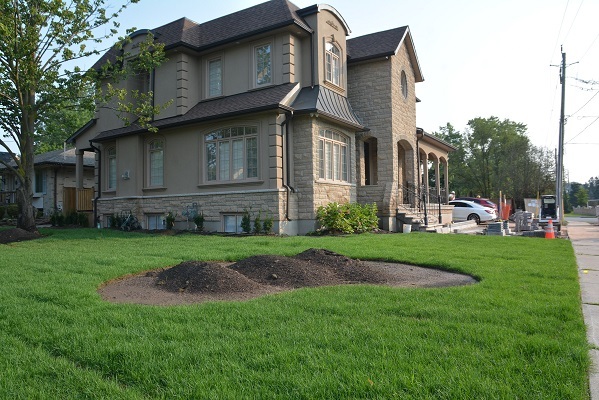 By Saturday, the south Oakville homeowners will be living the life in their breathtaking backyard retreat. That doesn’t mean 100% of the work on this alluring oasis will be complete - there are some loose ends to clean-up, but they will be able to pull up their loungers on the new stone patio deck and enjoy family time around the pool sanctuary. We’re into Week No. 5 of this complete backyard make-over and as promised it’s only a couple of the finishing touches that remain to be finalized. In the front yard, excellent progress has been made. The new flowerbed and stone walkway to the front door are nearly finished. 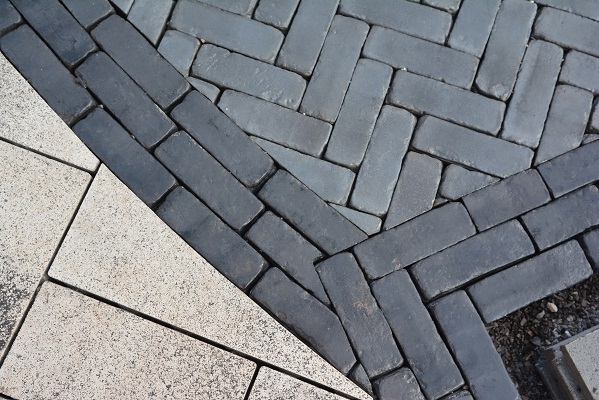 The Unilock stone driveway will be the last piece of the puzzle to complete the project. 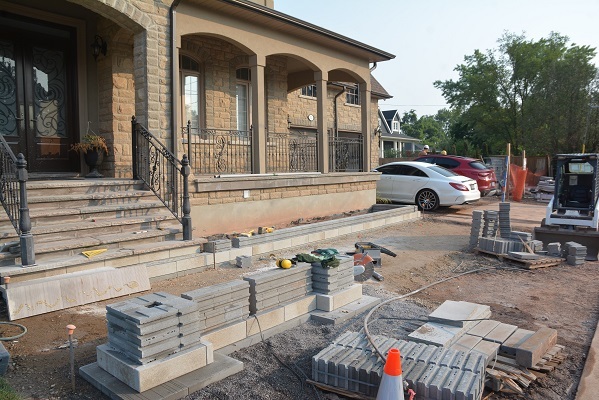 Green Ace Landscaping is still waiting for the gas fireplace insert and a cabana kit for the pavilion to arrive any day now – there are always last-minute details that keeps them on their toes. Throughout the life of the project there is a constant stream of new Unilock stone being delivered as needed. It’s seamless. As one or two palates are just being finished up for the front walkway, the next ones for the driveway are scheduled to arrive. It’s critical to get the timing right when you have a limited space for a street-front project like this. If you’re thinking about a landscaping makeover for 2019, the fall is a perfect time to visit the Unilock Outdoor Idea Center in Georgetown. Hours of operation and more information can be found at unilock.com. To read more about this project click here for the Week No. 1 intro and click here for the Week No. 3 update date. We will check back in a couple of weeks for a final report and photos of the completed project.